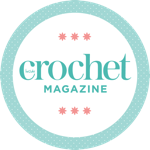 Inside Crochet is celebrating our 100th issue and with every paper edition of this special issue, we're giving you some stunning rose-gold goodies and Must-Have Mini yarn from Yarn and Colors so you can celebrate alongside us. If that wasn't enough, we're also inviting you to enter our biggest giveaway ever, with yarn, books, patterns and more all up for grabs. Now you can be just as excited as we are! Wishing all our readers a happy 100th issue!